We have sold lots of these inexpensive Panasonic P2 Card Readers (P2 Card Adapters) to television stations, digital filmmakers, videographers, electronic news gathering (ENG) professionals, etc. Our PCI bus interface PCMCIA CardBus PC card reader, Amtron PCD-TP-110CS, is proven to work with the Panasonic's innovative DVCPRO P2 (Professional Plug-in) cards designed for the IT news gathering (ING) industry and broadcasters. These new and inexpensive P2 card readers (P2 card adapters) are the perfect replacement for their expensive Panasonic counterparts. 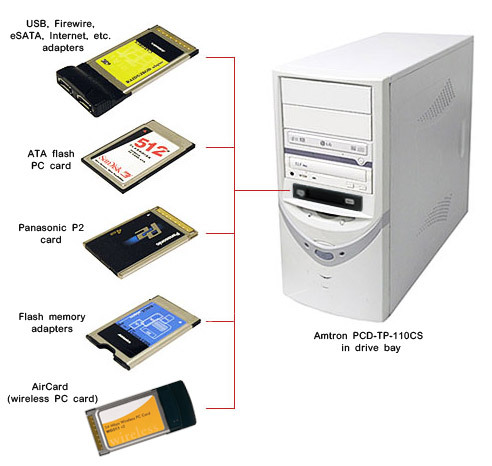 Installing this 1-slot PCI-to-PCMCIA CardBus PC card drives, Amtron PCD-TP-110CS (built with the best and most highly compatible Texas Instruments PCI1510 PCMCIA CardBus controller), is the most ideal method to add one PCMCIA CardBus PC Card slot to a desktop computer of any form factor (standard, mini-tower, low-profile, slimline, small form factor, etc. ), so users can enjoy the same PCMCIA functionality that a laptop computer provides. Panasonic P2 card mounts directly into the PCMCIA CardBus PC card slot on PCD-TP-110CS, so you have instant access for nonlinear editing and for faster data transferring into network. This front drive bay mounting or external mounting P2 card reader (P2 card adapter) is highly recommended because its unique design makes inserting or removing Panasonic P2 card much more convenient. All kinds of 16-bit PCMCIA PC Cards and 32-bit PCMCIA CardBus cards. PCMCIA wireless 3G / 3.5G AirCard for wireless broadband connection internet access. 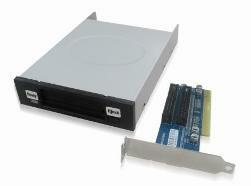 DEXIS Digital X-Ray System PC Card. If 2-slot P2 card reader is preferred and rear mounting is acceptable, please click here to see PCD-RP-202CS. Installing this low-profile PCI-to-PCMCIA card drives is an ideal method to add a PCMCIA CardBus PC Card slot to a desktop computer of any form factor (standard, mini-tower, low-profile, slimline, small form factor, etc). This high performance PCI interface front-access single-slot PCMCIA PC card reader-writer is compatible with any desktop computer with an available PCI expansion slot. The front 3.5" or 5.25" drive bay mounting or externally stand-alone design make inserting or removing Panasonic P2 cards and other PCMCIA PC cards much more convenient. 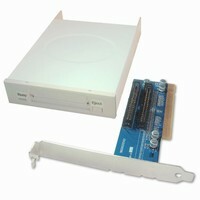 For customers who live in an area without wired high speed broadband connection, this PCD-TP-110CS PCMCIA CardBus card drives allows you to use a laptop wireless PC card on your desktop computer for wireless mobile broadband connection internet access. Amtron PCD-TP-110CS is recommended for wired and wireless modem PC cards (3G / 3.5G AirCard) such as Verizon / Sierra AirCard, Novatel Merlin, Cingular EDGE, Kyocera Passport, Sprint, T-Mobile, AT&T, Netgear, AirPrime, ACS, Fiberlink, SK-Earthlink, Qualcomm, and other wireless PC card modems using CDMA, WCDMA, EDGE, GPRS, GSM, UMTS, HSDPA, EV-DO (EVDO) technology.